The question of how best to store your whisky comes up a lot in the whisky world. While the casual drinker may only have a bottle or two of different whiskies around at any given time, enthusiasts tend to collect quite a variety. Given the cost associated with some of these bottles, what is the best way to store them to ensure minimal change in the flavour over time? There are a lot opinions available online – some of which actually run counter to evidence. So let me walk you through the best evidence-supported recommendations. For sealed bottles, the answer is fairly easy – store your whisky upright, in a dark (and preferably cool) place, minimizing light and temperature fluctuations. I’ll explain each of the reasons below. Upright is most important, as the high proof ethanol in whisky will degrade the cork over time if stored on the side – dissolving the cork, and tainting the flavour of the whisky. This comes as a surprise to most wine drinkers, who are always advised to keep wine bottles on their side. But that is because wine is much lower proof (lower alcohol content relative to water), and so the water in wine keeps the cork from drying out. This is important, as a dried-out cork will let air in, spoiling the wine. Unopened whisky bottles are fully sealed, and the contents do not change in the bottle so long as they stay sealed and well stored. I’ve seen comments online about “moistening” the cork periodically in whisky bottles (by temporarily tilting the bottle on the side). This does nothing of the sort, as the higher ethanol content is actually drying out the cork. But periodic contact of the whisky with the cork is not likely to harm it much – after all, this happens all the time when a bottle is handled or shipped. On that point, I routinely pick up bottles in my travels, and pack them in my checked suitcase for return travel. I have never had an issue with cork leakage in new, sealed bottles. Where you will get into trouble is with open bottles that are only partially-filled (as the extra air contracts and expands with pressure changes at altitude, causing the cork to pop out – more on this later). Note that minor leakage can occur with some screw caps enclosures, even if the seal is unbroken. Air pressure changes can cause small leaks as there is “wiggle room” for the cap to loosen slightly. You will want to give screw-caps an extra hand-tighten to make sure they aren’t loose to start, and encase the bottles in sealed containers. I use extra-large Ziploc freezer bags, and they do well to capture any minor leakage. 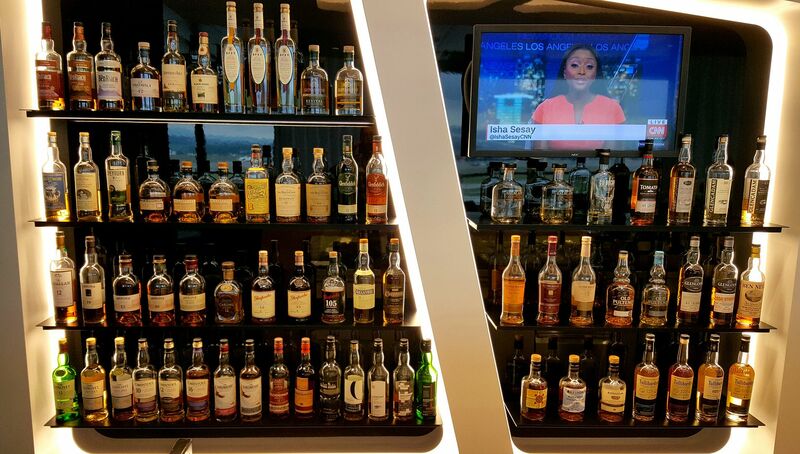 One exception to placing whisky in checked luggage is for smaller planes (used for short hops), where the cargo hold may not be within the pressurized cabin area. For any jetliner, you won’t have this concern, as the cargo holds are all pressurized. Your bigger risk traveling with checked bottles is breaking at the neck point, due to rough handling of your bag. So always make sure they are well-wrapped in clothes or bubble wrap (I find laser toner cartridge shipping bags great for this, with a pair of socks wrapped around the bottle neck). Also try to pack in the middle of the suitcase, not near an edge. Many studies have shown that sunlight is one of the biggest threats to whisky (some links provided below in my discussion of open bottles). Even indirect natural light will induce changes over time, so you are best storing your whisky in the dark – like in a cupboard with doors kept closed. Keeping them in their cardboard boxes/tubes will also help in protecting against light pollution. But I’ve also seen suggestions to ditch the cardboard boxes if you are planning for very long-term storage (i.e., decades), as the cardboard/glue can become a substrate for microbial/fungal contamination. But that only matters for the serious collector (who likely has a proper climate controlled dark environment for their whisky anyway). Once open, whisky will start to degrade in the bottle. This is a different sort of “aging” than what happens in the barrel during whisky production, which is necessary to make whisky (see my Sources of Whisky Flavour page for more info). Whisky does not “improve” with this sort of breakdown aging due to air exposure – although it can become more palatable to some, in certain circumstances (e.g., some of the chemical changes over time can make the whisky taste sweeter). In properly stored open bottles, the reason for the change in flavour over time is due to the presence of air. Specifically, the repeated air exchange as you pour a dram, and the expanding volume of air in the bottle over time. Interestingly, it is actually a bit of an open question as to how much of the change is due to the simple presence of air, versus its frequent exchange. Unfortunately, the academic literature (which I have reviewed) is not too concerned on this point. The few studies done typically explore these questions from a theoretical perspective, under acute laboratory conditions with specialized preparations that don’t reflect long-term concerns. As an aside, it is a pet peeve of mine to see this process of degradation in open bottles being referred to as “oxidation.” Oxidation refers to a specific chemical reaction that involves a transfer of electrons between chemical species (specifically, the stripping of electrons from the chemical that gets “oxidized”). Given the high proof of whisky, classic oxidative reactions at the gas-liquid interface are unlikely to be contributing in a major way to changing characteristics over time. Instead, it is a variety of other chemical interactions involving surface tension issues at the air-liquid interface that can alter whisky flavour over time. Again, the academic literature is largely focused on exploring specific types of chemical interactions individually, tested under laboratory conditions. At the end of the day, empirical observations using sensory analysis (i.e., tasting with blind tasters) is the best way to compare potential storage condition outcomes. A couple of recent attempts at actual whisky comparisons over time are helpful in this regard. Cited below are a recent small study by Mattias Klasson of scotchwhisky.com, and a more rigorous and detailed study by Marcus Fan. Before I get into their testing results, a brief explanation of popular storage options for open bottles of whisky is presented below. The first option is to simply leave the whisky in the well-capped bottle until it is gone. But a popular belief online is that the air-induced changes in whisky intensify once the bottle has dropped to less than half volume – and becomes extreme once only a small volume is left (i.e., only a “heel” of whisky left in the bottle). M y personal experience of keeping numerous open bottles for several years is consistent with the results of both studies referenced above: namely, a half-full bottle shows (at worse) only minimal effects over 1-2 years, but a largely empty bottle quickly begins to show noticeable changes. So practically, you probably don’t really need to worry until you pass the point where there is more air in the bottle than whisky. A related question comes up about storing whisky in crystal glass decanters (for display purposes). Here again, the indirect light issue comes into play, as you will degrade the whisky over time (even faster than you will from the air). Even worse, those clear crystal decanters are actually lead crystal. The high proof alcohol in whisky will gradually extract lead from the glass, dosing you with something you will definitely want to avoid. This is probably the most popular option in the whisky enthusiast community. To minimize air “headspace”, simply pour the whisky into smaller glass bottles. Commonly available are Boston round bottles in 0.5, 1, 2, 4, 8, and 16 oz sizes. These are available in clear glass or, better yet to minimize light effects, amber or cobalt blue glass. The results of both the Fan study and the Klasson study support this method as one of the best ways to minimize air effects. Bottles caps matter here though. The best bottle enclosures are phenolic screw caps (made from black polypropylene). But do not use the cheaper ones with paper liners. Instead, use only polycone liners (see attached photo comparison). The cheaper caps use pulp paper with a thin polyethylene coating, and are intended for aqueous solutions only (i.e., pure water-based). These will degrade rapidly in direct contact with high-proof alcohol fumes. You will soon find the liner contents dissolving into your whisky, making a disgusting mess. I’ve seen this happen to a few sample bottles I’ve received in swaps with other reviewers, when I didn’t check the caps (for samples I didn’t get to right away). Polycone liners are conical-shaped liners made of an oil-resistant plastic – and are designed to resist chemicals, solvents, oils, etc. This decanting approach into smaller glass bottles is the consistent first choice across all studies for long-term storage. My personal experience also supports this conclusion. Ideally, you should aliquot (pour into smaller bottles) as soon as you open your whisky, to minimize any effects of air-induced aging over time. As an aside, a cheaper alternative is to use clear plastic PET (polyethylene terephthalate) bottles. While it is true that some bottom-shelf whiskies come in PET containers (along with many other food and liquid stuffs), the long-term effect of storage of high-proof alcohol in these containers is unknown. It is reasonable to worry about the potential extraction of plasticizers over time (i.e., the additives used during production to keep the plastic from becoming too brittle). At a minimum, it would be important to ensure you are getting food-grade PET bottles, with proper polycone caps. In the Klasson study, they use “cheap PET bottles” (source not identified), and found a significant change in flavour over time. I’ve kept whisky in food-grade PET bottles for up to 6 months, and have not noticed any off flavours. But I would consider this a riskier proposition, and recommend you stick with glass bottles if at all possible. A seemingly ingenious solution to the air volume issue is to pour glass marbles into the original bottle as the whisky volume drops, thus minimizing air headspace. Sounds reasonable, right? Except this approach means that you are greatly increasing the whisky-to-glass ratio over time, especially as the volume drops. All that increased glass surface area is an opportunity for interactions to occur (i.e., there is more surface for the congeners and other flavour molecules in the whisky to “stick” to). At a minimum, you would need to ensure the marbles were scrupulously cleaned and sterilized before use. And I have no idea where you would get food-grade glass marbles to start with – children’s toy marbles are not likely to be made of high quality glass, and are likely to contain various contaminants that could leach out in the presence of high proof alcohol (e.g., lead). Conducted properly though, this approach is likely to work – as demonstrated in the Fan study. But I think you are best to decant into smaller glass bottles. This is a popular option for those coming from the wine world. The principle is that an inert, neutral gas like argon (Ar) can be sprayed over the surface of the liquid, thus preventing the lighter-weight oxygen (O2) from reaching the wine (or whisky) once re-corked. There are various “wine preserve” brands out there, each with their particular (and often undisclosed) blend of argon, nitrogen (N2) and carbon dioxide (CO2). Keep in mind, these sprays were all developed and tested on wine – it is unknown how the much higher proof whisky would react. One obvious concern is that wine “preserved” this way was only meant to be kept for up to a week or two. Long-term storage effects (typically months to years for whisky) are thus largely unknown. A potentially greater problem is that the spray canisters need a food-grade aerosol propellant in order to eject the “inert” gas down the long extended tube into the whisky. In the old days, this was Freon – but that has since been replaced by butane and propane. It is not at all clear what the long-term effects of adding butane/propane, as well as Ar/N2/CO2, inside a whisky bottle would be. The chemistry that occurs at the air interface of high-proof whisky is complex and not fully understood – adding these extra variables would be a concern. Indeed, in the study by by Fan, the most popular neutral gas spray – Private Preserve Wine Preserver (shown above) – consistently induced greater flavour change than any other condition beyond indirect sunlight. While exposure to regular air had noticeable effects when the whisky volume was very low (e.g. 150 mL in a 750 mL bottle), these were almost twice as noticeable when wine preserve spray was used. Simply put, wine preserve was considerably worse than just regular air exposure in a bottle. On the basis of these findings, I strongly recommend you do NOT use neutral gas sprays in your whisky bottles. Another popular option from the wine world. Typically, a specialized rubber cork is placed at the opening of the wine bottle, and a hand pump is used to extract most of the air from the bottle (creating a partial vacuum). I’ve used this myself, and it does help keep wine flavourful for a few days (compared to simply re-corking). The main issue for whisky is that the seal is not likely to last over the long term – and again, the high-proof ethanol is likely to degrade the rubber gaskets over time. I’ve not seen a whisky study done using wine bottle vacuum seals, but the Fan study did look at placing the small whisky bottles in standard food vacuum sealer bags. Their results showed no net benefit (or impairment) to this whisky using this method. As a result, I recommend you stick without the vacuum seal complexity. A standard in any chemistry or biology lab, Parafilm is a thin plastic film of paraffin wax. Paraffin is a soft, colourless wax used for making candles and crayons, among other things. Parafilm is used in labs to temporarily seal an open container (like an Erlenmeyer flask), or for longer-term storage of lidded containers (where are you are trying to prevent moisture or air contamination). While Parafilm can certainly be degraded by various chemical solvents, it is relatively resistant to ethanol. Unfortunately, Parafilm is still relatively gas permeable, so it is best suited to serve as physical barrier for liquid penetration. I personally use it when transporting whisky – especially when carrying sample bottles on airplanes. The pressure changes are likely to cause leaks, and Parafilm is very helpful in minimizing these. But as a way to preserve whisky in the bottle, it likely only of minimal effectiveness – and therefore probably not worth the effort. Based on the evidence to date,you will want to keep your whisky upright and in the dark (preferably in a consistently cool place). If you want to maintain the flavour profile of open bottles for as long as possible, you are best to decant into small glass bottles (with proper polycone caps), minimizing any air headspace. Just about anything else brings with it potential risks, and either lacks evidence of effectiveness (e.g., vacuum seals), or has clear evidence of negative effects (e.g., neutral gas sprays). I hope you found the above useful. I’ll update this post if any new studies come out that I think are of particular relevance. 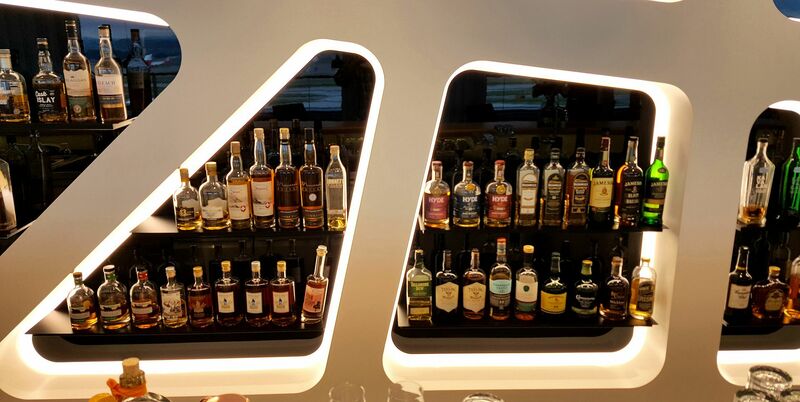 I don’t normally write reviews of Business Class lounges – since the whisky collection is usually pretty minimal and inconsistent. But this is my first experience of finding a fully-stocked whisky selection that rivals dedicated whisky bars, so I thought I would share. When traveling in Europe, I find Lufthansa Senator lounges pretty decent experiences, and better than most Business Class lounges (including Lufthansa’s own Business lounges). But a whole new experience for me was the SWISS Senator Lounge in the Terminal E building of the Zürich Flughafen (ZRH) airport. While SWISS International Airlines is a member of Star Alliance, only some of their lounges in Zurich are open to non-SWISS flight passengers. 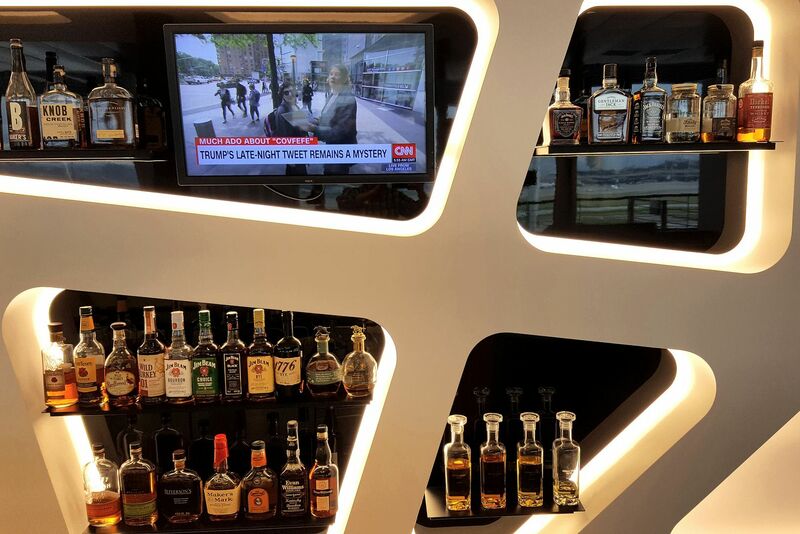 They recently built a suite of new super high-end lounges in the Terminal E building, including an exclusive First Lounge, the Senator Lounge (open to Star Alliance Gold), and a regular Business Lounge (which is appended to the Senator lounge). They are located on the 3rd floor (with elevator access), close to Gate E37, and are open from 06:00 – 22:30. Access is a bit complicated – this Senator Lounge E is open to First Class passengers on SWISS, Lufthansa and Star Alliance, as well as frequent fliers who hold status as HON Circle, Miles & More Senator, and Star Alliance Gold. Regular Business Class passengers on any of the above airlines without such status don’t have access to the Senator Lounge E, only the smaller Business Lounge. The Senator Lounge E has a lot going for it – great food (personal chef to make an egg breakfast however you would like), very spacious design and set up (including outdoor seating area), and all the usual amenities (showers, business workstations, etc.). But what really distinguishes the Senator Lounge is the “Whisky Club 28/10” – a whisky Bar with a choice of over 200 whiskies. Surprisingly to me, this whisky bar is open the whole time the lounge is (I was there at 07:30 last week), with a server on duty. The whisky bar is also complimentary – there is no charge for any of the whiskies on hand. Over 180 were on display, shown below, with more out of site behind the bar. Depending on your browser, doube-click or right-click on any of the images below, and then view image (should take you to my photobucket account, where you can zoom in to see higher resolution pics of all the visible bottles). As you would expect, the bar is well stocked with entry-level bottles from across the world of malt whiskies, blends and bourbons. Impressively, most of the single malts have age statements (typically in the 10-16 year old range). There are some older bottles interspersed, including some independent bottlings (i.e., several Signatory, in the ~19-21 year old range). It’s also a great place to try out Swiss whiskies as well (16 bottles on hand). Given the early hour, I only sampled two. 😉 Reviews coming soon. If you are traveling through Zurich and have appropriate status (or are traveling First Class), it is well worth checking out. Note that if you are not departing from Terminal E, there is a passport control station and a subway connecting you to the main terminal. So you would need to give yourself plenty of time to make your connection back and forth to the main terminal A/D gates. 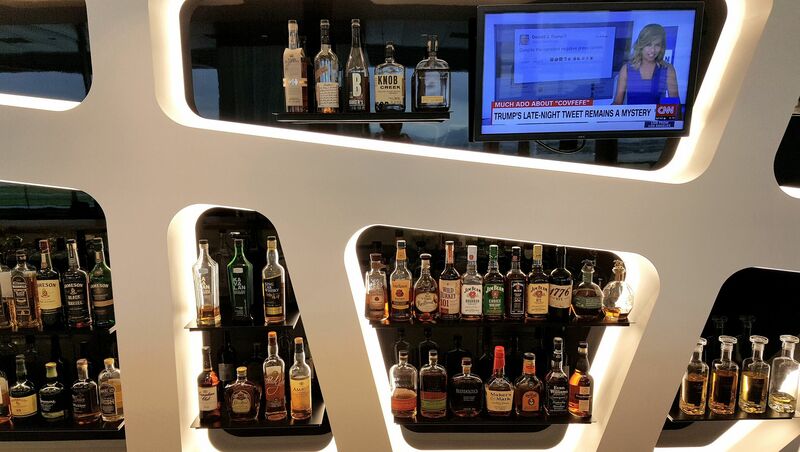 You can read a full review of this lounge – with detailed pics of all the amenities – from one of the well-known airport lounge bloggers, the Points Guy. I agree with his take on this lounge. Welcome to my new recommendation list for 2016! As with last year, I am breaking this up by price point, style and flavour cluster. I will again focus on highly-ranked but relatively affordable bottles – and ones currently in stock at the LCBO. I am also going to focus on whiskies that are not necessarily available all year round – some of these only show up for a limited time around the holidays, so grab them while you can. Links to full reviews given, when available. Hopefully this list is also relevant to those outside of Ontario, as it is based on high-ranking whiskies. As always, the Meta-Critic Whisky Database is here to help you sort through whatever possible options are open to you. You won’t find single malts in this price range (although there are some very nice Scotch-style and Irish blends, profiled below). But let’s consider the economical American bourbon and Canadian whiskies options here first. While Ontario is not a good place to find higher-end American bourbons, we actually do have very decent prices on what we do get in. And we have at least a reasonable selection of the more entry-level and lower mid-range stuff. It’s worth breaking bourbons down into different mashbill classes. The first is low-rye bourbons (i.e., a relatively low proportion of rye grain in the predominantly corn-based mashbill). Unfortunately, one of my favourites in this class – Eagle Rare 10 Year Old – is not currently available (although you might still find a few bottles at the some of the larger LCBO stores). So the closest thing is the more widely available Buffalo Trace at $43 CAD, getting a decent 8.56 ± 0.42 on 19 reviews. This is basically the same juice, though not quite the full 10 years of age. A great choice that Ontario still carries is the Elijah Craig 12 Year Old at $48 (8.68 ± 0.29 on 20 reviews). This has been replaced by a younger no-age-statement “small batch” version in U.S. Note the 12yo version has a fairly pronounced “oaky” character. Rated even higher is Knob Creek Single Barrel Reserve ($57, 8.79 ± 0.27 on 10 reviews) – a popular cask-strength (60%) option. For high-rye bourbons (which typically are more “spicy” tasting), you can’t go wrong with Four Roses Single Barrel at $46 CAD (8.72 ± 0.34 on 18 reviews). It’s worth the premium over the otherwise decent Four Roses Small Batch at $40 CAD (8.49 ± 0.44 on 19 reviews). Unfortunately, most of the other high-ryes I would recommend are currently out of stock (and unlikely to come back this year). But why not try a quality Canadian choice? These are typically widely available all year round. Sure, you could go for Jim Murray’s “World Whisky of the Year” for 2015 – Crown Royal Northern Harvest Rye – for $35 CAD. It gets a decent Meta-Critic score of 8.59 ± 0.42 on 13 reviews. But like many, I consider it to be only an “average” Canadian rye. As with last year, my top pick as the king of Canadian straight rye whisky is Corby’s Lot 40. Getting an excellent 8.90 ± 0.41 on 18 reviews, it is quite affordable at $40 CAD. One of the best aromas you will find in the rye selection at the LCBO. Wiser’s Legacy is another solid choice, with an even higher 9.01 ± 0.35 on 15 reviews. Regularly-priced at $50 CAD, it has a spicy rye flavour (and is said to consist of Lot 40 in part). As always, Alberta Premium Dark Horse at $32 CAD is a great buy – if you like a little sherry flavour in your rye. 8.62 ± 0.34 on 15 reviews. I don’t typically break down Scotch-style blends by flavour profile (as I do for for the more complex single malts below). But you can generally think of blends in two categories: those with some smokey/peaty flavours and those without. For those who like a bit of smoke, Johnnie Walker Black at $57 (8.27 ± 0.49 on 21 reviews) remains a staple – and for good reason. It is higher ranked than most of the other smokey blends – but it is also priced higher. So if you want try something a little different on a budget, the LCBO also carries the higher-ranked but lower-priced Té Bheag for only $39 (8.47 ± 0.31 on 14 reviews). Pronounced chey-vek, this whisky has a more fruity character than JW Black, and even more smoke (if you think the recipient would like that). Another great choice is Great King St Glasgow Blend for $57 (8.57 ± 0.25 on 11 reviews) – one of the highest-ranked smokey blends I’ve seen. For non-smokey blends, these are often imbibed as mixed drinks, or the classic scotch-and-soda. There are a lot very good blends out that you may not have heard of – unfortunately, the LCBO is not carrying many at the moment. For example, they are currently out of stock of Great King St Artist’s Blend for $55 (8.58 ± 0.38 on 18 reviews), which would have been a top pick. So why not try a great Irish blend instead: Writer’s Tears for $50 (8.47 ± 0.37 on 14 reviews). Unusual for an Irish whiskey, this is a blend of single malt whisky and classic Irish pot still whisky (which is a mix of malted and unmalted barley in a single copper pot still). Very flavourful, and a good value. A personal favourite of mine in this group is Suntory Toki at $60 CAD (8.24 ± 0.63 on 5 reviews). I feel the quality here is higher than the Meta-Critic score indicates (which is based on only a limited number of reviews so far). It is delightfully fresh and clean, easy to sip neat, and is highly recommended in the classic Japanese “highball” (scotch-and-soda for the rest of us ;). Here is a chance for you to experience an authentic Japanese whisky, without the usual high cost. It’s a great introduction to the lighter Japanese style. Single malts come in a wide range of flavours – much more so than any other class of whisky. As usual, it is worth recommending single malt whiskies by flavour “super-cluster”, as described on my Flavour Map page. I’m going to start with the more delicate examples below, followed by the more “winey” and “smokey” examples. BTW, If you are interested in checking out another Japaenese whisky, consider the Hibiki Harmony at $100 (8.40 ± 0.61 on 14 reviews). It comes in a fancy decanter-style bottle, and has a richer yet still delicate flavour profile. Again, I think the Meta-Critic Score is unfairly harsh here – this is a lovely blend, and is a more flavourful expression than the Suntory Toki described previously. Super-cluster G-H : Light and sweet, apéritif-style – with honey, floral, fruity and malty notes, sometimes spicy, but rarely smokey. At $95 CAD, the Dalwhinnie 15 Year Old is my top pick in this category (8.68 ± 0.35 on 18 reviews). That is a phenomenal score for this flavour supercluster (i.e., delicate whiskies always score lower than winey/smokey ones). The Dalwhinnnie is a fairly delicate whisky, but there is a surprising amount of subtlety here. It has a lovely honey sweetness to it (but is not too sweet), and has just the slightest hint of smoke in the background. Well worth a try – a staple of my liquor cabinet. Backup choices you may want to consider are The Arran Malt 10 Year Old at $70 CAD (8.55 ± 0.33 on 20 reviews), and the An Cnoc 12 Year Old at $80 CAD (8.62 ± 0.35 on 17 reviews). The Dalwhinnie is worth the slight extra though, in my opinion. It is actually on border of Super-cluster E-F and cluster I (due to the moderate smoke), but my top pick here is Amrut Fusion, from India. At only $86 CAD, and scoring an amazing 8.90 ± 0.24 on 22 reviews, this is certainly an excellent choice. It’s also an opportunity for those looking to explore some extra “tropical” fruit flavours in their whisky – check out my full review above for more info on this whisky. Note that this one is very popular, and so stock levels are already starting to drop across the LCBO. Ot herwise, my top mid-range choice in this category is an Irish whiskey, the $80 CAD Redbreast 12 Year Old. Redbreast is a single pot still whiskey. As mentioned earlier, this is a traditional Irish style, where both unmalted and malted barley are distilled together in single copper pot still. The end result is thus closer to a Scottish single malt than a blend. It gets a very good 8.75 ± 0.42 on 21 reviews. If you are looking for a budget option in this class, check out the Auchentoshan 12 Year Old. At $65 CAD and scoring 8.27 ± 0.26 on 21 reviews, this is a step up from your typical ubiquitous Glenfiddich/Glenlivet 12yo. My top pick here remains the Aberlour A’Bunadh. I don’t understand how this has remained at $100 CAD, given the quality of the various batches. It gets an impressive 8.95 ± 0.17 on 22 reviews overall. While there is some variability between batches, this is not usually significant. Note however that this is a cask-strength whisky, so it packs a higher concentration of alcohol than typical. And inventory tends to disappear fast around this time of year – it’s a popular one. My budget choice, at $73 CAD, remains the GlenDronach 12 Year Old. It gets a very respectable 8.57 ± 0.22 on 20 reviews. It packs a lot of flavour. Now, let’s dial back down the winey flavours, and instead bring up the smokey complexity. In addition to the Amrut Fusion already mentioned above, you would do well to stick with a classic member of this class: the Talisker 10 Year Old. At $100, it gets an excellent 8.91 ± 0.17 on 21 reviews. I don’t think you can go wrong with this choice. Also very nice, but with low availability is Longrow Peated ($101, scoring 8.79 ± 0.27 on 13 reviews). It is right on the border with the smokier Cluster J, though. A reasonable budget choice – especially if you like a little sherry in your smoky malt – is the Highland Park 10 Year Old ($65, 8.47 ± 0.28 on 14 reviews) or 12 Year Old ($80, 8.38 ± 0.36 on 12 reviews). Unfortunately, quality seems to have dropped in recent batches of the 12yo, otherwise this one would have been a a top pick (i.e., it used to score higher). For the smoke/peat fan, you really can’t top the value proposition of the Laphroaig Quarter Cask – only $73 CAD, yet garnering a very high meta-critic score of 9.02 ± 0.27 on 21 reviews. That’s a remarkable score for the price, if you are into these peat bombs. Surprisingly, it’s even cheaper than the standard Laphroaig 10 Year Old expression ($84 CAD, 8.92 ± 0.29 on 14 reviews). The Ardbeg 10 Year Old is another consideration for an entry-level expression ($100 CAD, 8.95 ± 0.34 on 21 reviews). If you like a wine-finish, for a very limited time you can order a bottle of this year’s Laphroaig Cairdeas for $100 (2016 Madeira edition, 8.82 ± 0.48 on 8 reviews) through LCBO online. Of course, there is a lot more to consider if you are willing to go a bit higher. Stretching the budget a bit to $123 CAD, a very popular favourite is the Lagavulin 16 Year Old. It gets an incredible meta-critic score of 9.23 ± 0.23 on 25 reviews. Full of a wide array of rich flavours, I find it a lot more interesting than the younger peat-bombs above. Just be prepared to smell like a talking ash-tray for the rest of the evening! Again, whatever you choose to get, I strongly suggest you use the Whisky Database to see how it compares to other options in its respective flavour class or style. It’s been a little over six months since I launched WhiskyAnalysis.com, and in that time the site has grown considerably. I have nearly doubled the number of modern whiskies tracked in the Whisky Database – now exceeding 600 that meet the minimum threshold of at least 3 reviews. The average meta-critic score for all whiskies that I track is currently 8.55 ± 0.56. That includes almost 5,500 individual whisky review scores – all manually curated, to ensure the same whiskies are being tracked across all reviewers. And that number is an under-estimate of the work involved, as I also have to track the individual members of one of the two reviewer collectives that I include (which then gets combined into single composite score for that collective). I also continue to add new reviewers to the database, where they meet the minimum requirements outlined here. There is a lot of great information on recent whiskies that continues to be developed and presented online. I am also continuing to add my own whisky commentaries, with more detailed personal tasting notes now. Hopefully you find these reviews and the additional industry analysis articles useful!